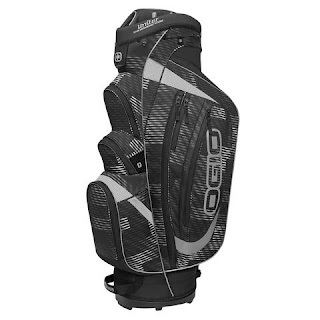 Grab dad this Ogio Shredder Gold Cart Bag for $77 (Retail $159.99) with code PZY77 at checkout. First, let's talk about size. Not too big, but not too small, the Shredder will fit a lot of gear and still stay carry-ready. That's because it's got storage. Lots of it. Zippered, Hook and Loop, fleece-lined -- it has a pocket for every accessory. And a 15-way organizational club management system to keep everything in place. Yet it's lightweight, with padded straps that sit perfectly on your shoulder and support the whole weight of the bag -- even when it's filled with your clubs.